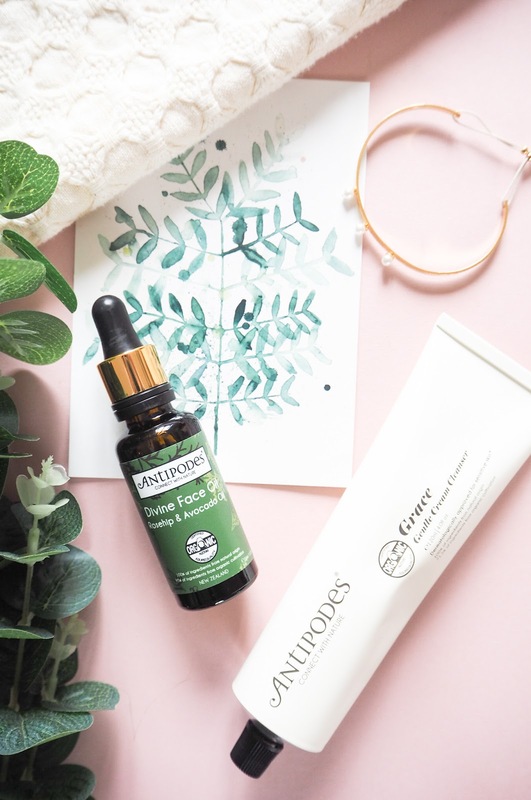 Antipodes is a scientifically validated organic skincare brand from New Zealand. It’s a brand I’ve heard lots about through the blogging community but until now I hadn’t tried anything from them. I think a good cleanser and facial oil are staples in a skincare routine. Antipodes kindly sent me their Grace Gentle Cream Cleanser and Divine Face Oil with Organic Avocado Oil and Rosehip to test out. I’ve been using both products for a few months now and wanted to share my thoughts. First up the Grace Gentle Cream Cleanser. It has the most beautiful thick cream consistency that melts away makeup and is gentle enough to use as both your first and second cleanse without stripping the skin or leaving it feeling tight. I believe it would be suitable for all skin types, even oily skin. Unlike plastic bottles, the metal tube packaging of the cleanser means you can squeeze out every drop of the product, meaning less waste! The Divine Face Oil with Organic Avocado Oil and Rosehip makes my skin glow! Even if you have oily skin, I would 100% recommend using an oil such as this, it stops your skin from overproducing its own oils which can sometimes lead to spots. The Antipodes oil wasn’t sticky and didn’t leave me feeling overly greasy. I apply a few drops at night after cleansing, the Rosehip ingredient that helps to soothe my skin when it’s dry or inflamed. Plus the dropper makes the product more hygienic! I adore the packaging of both the Antipodes Grace Gentle Cleanser and the Divine Face Oil with Organic Avocado Oil and Rosehip, they look great on your bathroom shelf. The scent of both products reflects the organic origin of the ingredients, I would describe it as an herbal fragrance. Some may be sensitive to this, but I wouldn’t say it’s a heavy scent that lingers all day. I’m dying to try their face masks next. Have you tried any Antipodes products? Lovely review! I quite like the idea of a herbal scent, definitely want to try this, it sounds really good! I am really interested in trying out the oil! Great review.